After a long day of meetings earlier this week, I retreated back to my hotel room and decided to turn on the TV while I caught up on some unanswered email messages. I landed on the National Geographic channel and a show called "Brain Games." I know what you're thinking — nerd. But feeling like I had very few left at that point (brain cells that is), I figured it couldn't hurt watching, at least for a little while. The show discussed brain mechanics and the way it uses familiarity to make all types of decisions: good, bad, or neutral. In a test group, they gave people six different stock ticker symbols to pick from, and they had to guess which three of the six showed the greatest gains. Three of the symbols consisted of 3-4 random letters. The other three actually spelled a short word (see below). The majority of those surveyed picked the stocks whose ticker symbols spelled a word. While these three turned out to be the WORST selections (all three "word" stocks declined while the "non-word" stocks all increased), the host explained that because the brain looks to the familiar to make its decisions, the most comfortable choice were those ticker symbols that formed something familiar — a word instead of a nonsensical assortment of letters. Next, they turned to consumers and the choices we make every day based on what’s familiar. They said shoppers are consistently willing to pay up to 30% more for those brands with which they are most familiar. I’d argue it’s often even more than that. Take these two water bottle choices I found at the convenience store yesterday. 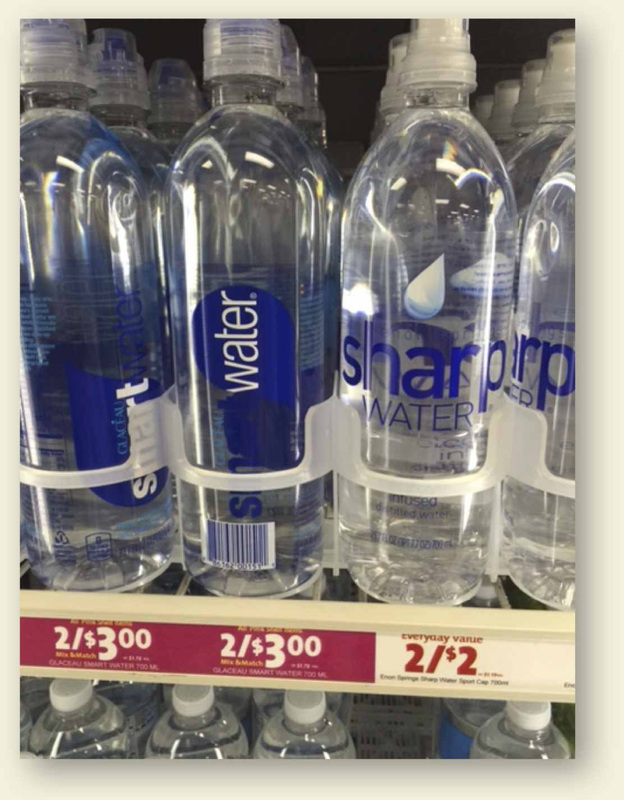 "Smart Water" — the brand name that was first to position itself as a "better" water — sat right there on the shelf next to its competitor "Sharp Water." The former proudly showed a price that was 50% more than the other guy. Same smooth and shapely bottle. Same number of ounces. Same protective cap. Smart Water is "vapor instilled" while Sharp Water is similarly "infused distilled water." But here’s the real difference. Smart Water blazed the trail. They started the category. They convinced consumers they needed water that was better for them. It is the brand with which consumers are most familiar. And that is one reason they command a 50% higher price. Does that mean no one buys the knock-off? Certainly not. They may both be enjoying wonderful sales of their products. But if I had to guess, at that margin it’s Smart Water that’s enjoying greater profitability. And isn’t that what marketing SHOULD be all about anyway … improving profit? So what’s the takeaway from the "Brain Games" segment and then my water experience at the convenience store? It’s about as simple as it gets. Advertise. Publicize. Sponsor. Promote. Market. Get in front of people, people! After all, familiarity breeds trust, and trust is the cornerstone of a valuable brand.